I headed out to Albertson’s early Sunday looking for beef ribs or a tri-tip to smoke on a beautiful June day. I struck out on both of those, but did come home with two whole chickens and a plan for meals throughout the week. 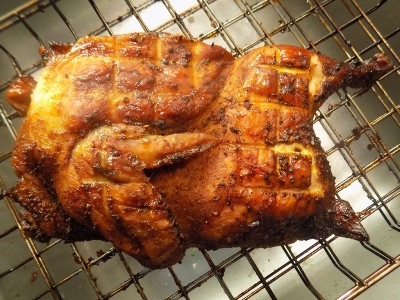 I did a couple of searches for smoked chicken halves and decided to combine a couple of ideas from over at smoking-meat.com into one of my own. Mix the beer, water, salt and brown sugar in a large bowl, stir until the salt and sugar have dissolved. I purchased two whole chickens, so I split them in half, and cleaned them out. I then rinsed them and placed two halves each into a gallon storage bag. I added the brine mixture on top of them and let them soak in it for 3 1/2 hours. Prepare your smoker to smoke at 230 degrees. I decided to use mesquite smoke for these chickens, but I think that all smoke is a matter of preference and personal taste. Remove the chickens from the bag, and rinse, so as to remove extra salt from the chickens. 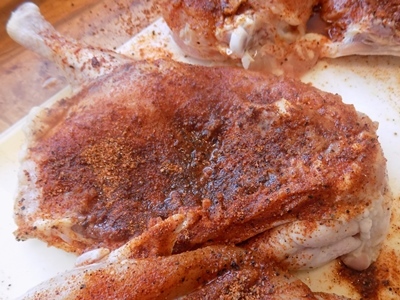 lay them skin side down and cover the meat with your choice of rubs. Let sit for 15 minutes or until some of the brine has been pulled back out of the meat, creating a paste on the bird. Flip them over and rub the skin side. Place in the smoker and smoke away until the internal temperature is at 170 degree. It took me close to 5 hours to smoke these four halves yesterday, but they were huge chickens. Your best bet is to make sure you have a meat thermometer inserted to see how it is coming along. The chicken was amazing. The brine ensured that it wouldn’t dry out and it was wonderfully moist, even after 5 hours in the smoker. We enjoyed it with a smoked baked potato, and steamed vegetables. We will enjoy it further this week with smoked chicken salad, the recipe for which I’ll share tomorrow! I crave the comfort that smells of simmering sauces wafting in from the kitchen impart on a Sunday afternoon. Maybe it is a wish for days gone by that were not so busy, maybe it is the sense that the weekend will wind down with good food. In our busy lives Sunday has become a day for family. There are no dance lessons, no girl scouts, very few outside commitments. It is a day where we can often catch our breath and move on to the new week. So when Sunday comes and we are home, I love to have a nice sit down dinner, knowing it may be the only time this week that it happens. Sunday dinner can range from homemade pizza to venison to pasta. There is no set formula, except time is spent in the kitchen. Sometimes it is accompanied with a glass of wine or a beer, often it is not. It all kind of depends on what moves my in the kitchen that day. Since I love to share Sunday dinner with my family and will share many of them with you here on the blog. Today’s Sunday dinner is an experiment that was inspired by a fellow St. Bonaventure grad who writes the Al Dente eating blog. Jared made a chicken bouillabaisse last week for his blog, I tackled seafood for mine, thanks to a great mixed seafood deal at King Soopers which screamed “throw me in a stew”.